Rest and relaxation awaits you at Lagoalinda Inn. This mountain retreat is a great place to refresh your spirit and soul. The beauty of Lake Junaluska will take your breath away. Come and escape to the mountains of Western North Carolina...you may never want to leave. We are located at beautiful Lake Junaluska, N.C. which is 26 miles west of Asheville. 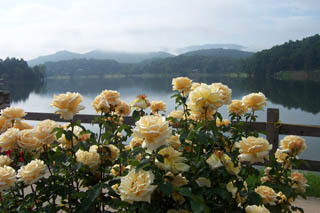 The pristine mountain lake is nestled amid the majestic Blue Ridge mountains. You can also visit and stay at, CokesBury Cabin , our other accommodation in the area.